SEO Case Study: Assist with seo for important search terms and keyword phrases for Britannia Printers Inc., located in Toronto, Ontario. Service Area: Greater Toronto Area (GTA), and North America wide. Products & Services: Full commercial printer including book printing, magazines and journals, business forms, school year books, promotional and marketing material, business cards and more. 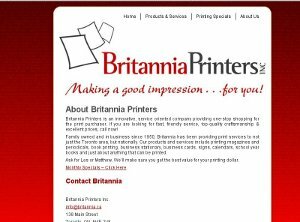 Ian Scott and Britannia Printers Inc have enjoyed a very long lasting relationship. Since 1998, we have used this great Toronto commercial printing company for a variety of products including printed material for both our own business and our clients. One of the challenges for Britannia was to obtain superior search engine results for a variety of search phrases and keywords. We began working with them on this in October of 2010 and within a few short months, we had Britannia ranking highly on Page 1 of Google.ca for a number of those search terms. “Britannia Printers has had a close working relationship with Ian Scott Group since 1998. We have collaborated on a number of projects together and have enjoyed working with each other. In the autumn of 2010, we took advantage of the skills in search engine optimization that Ian Scott has. When they began working on our behalf to get our website to appear higher in the search engines for words and phrases related to our business, it was very hard to find our website with any search terms aside from our business name. Just a few short months later, Ian Scott had us ranking much higher in both the organic and “Local Places” search results. In fact, for some search terms, we are ranking in the top three positions on page 1 of Google.ca. Thank you so much Les! We enjoy working with you and we have really enjoyed helping you obtain better search engine rankings that have been valuable to your business and that have actually helped increase the number of new customers and clients! We look forward to a long lasting relationship with you.